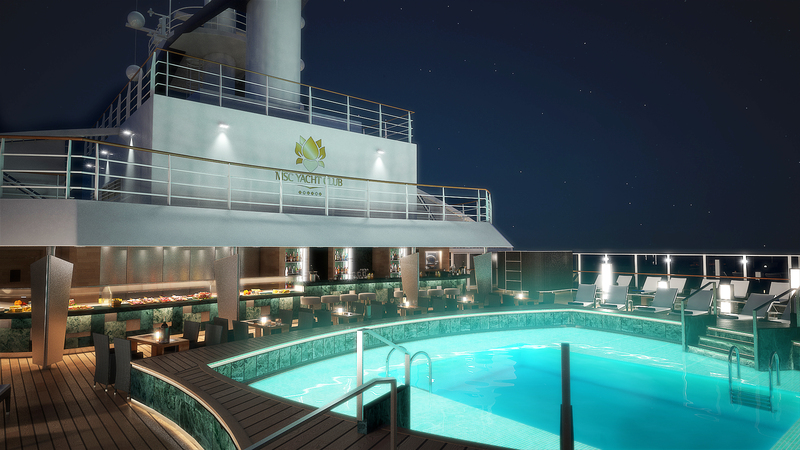 MSC Cruises' new flagship launched at the end of 2017 and it's really making waves. 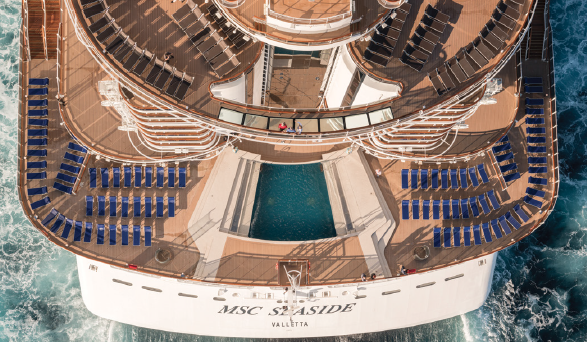 Designers of the MSC Seaside had a goal: to bring guests on a big ship closer to the sea. They threw out the playbook and started fresh, creating the Seaside, a new prototype for a class of ships inspired by an elegant Miami beach condo. It's all part of getting back to the sea. You'll never be far from a view of the ocean on the Seaside. Three-quarters of the staterooms are ocean-facing. They include beach condo-inspired, chic aft corner suites, exclusive balcony staterooms whose private terraces overlook the ship's promenade and even modular, extended family staterooms that can be configured for groups of up to ten. It's one of the widest on any ship ever built. This extravagant, wrap-around public space takes guests strolling past al fresco bars and restaurants in an experience reminiscent of – no surprise - a chic seaside town. Take a deep breath and keep strolling, over the hundred-foot long, glass-floored 'Bridge of Sighs' projecting out from the ship on the top deck 131 feet high. You'll feel like you're walking in the air - part of the sea breeze wafting around you. From walking on ocean breezes to walking on water. 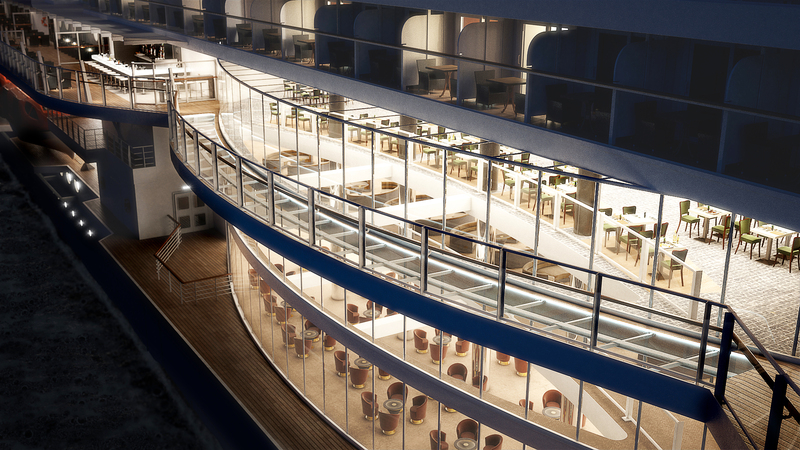 Two, 131-foot-long catwalks with glass floors continue the theme of connecting you with the surrounding marine environment. And there's still more panoramic glass: elevators that whisk you up and down with yet more stunning views of the sea. 4. Entertainment in the Atrium. On most ships, a place to pass through. 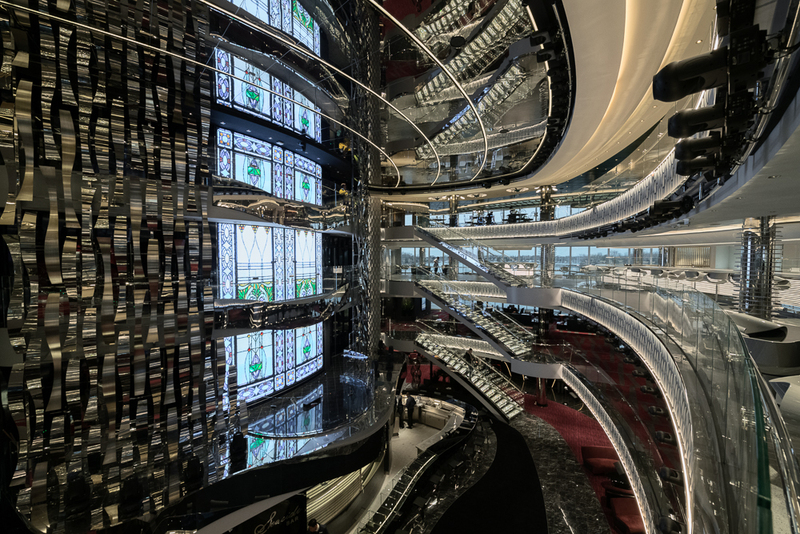 On the MSC Seaside, the magnificent, three-story atrium isn't just the stylish heart of the ship. It's also an impromptu, multi-media, multi-level 'stage'. Who knows what you'll discover: dancers and acrobats? Music? Game shows? Flash Mobs? Karaoke? Or light shows? If you like spontaneous delight, make sure to keep the atrium on your Seaside agenda. Race a friend side-by-side on two of the longest zip lines at sea, nearly 350 feet to the finish line at the back of the ship. Or spend your day super-soaked in the vast water park with 5 interactive aquatic adventures. Infants right through teens have their own programs that entertain the kids and free up Mum and Dad's time for much-needed grown-up relaxation. 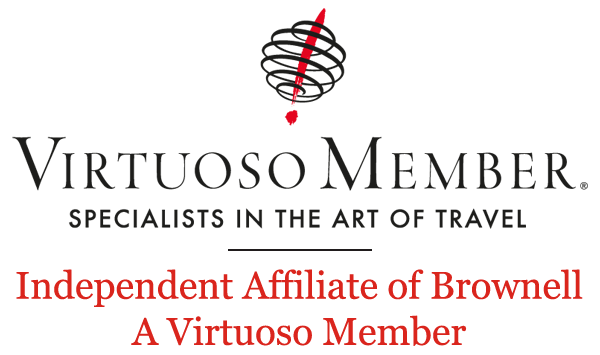 Plus MSC has a Lego partnership that makes kids sorry to leave when the holiday is over. 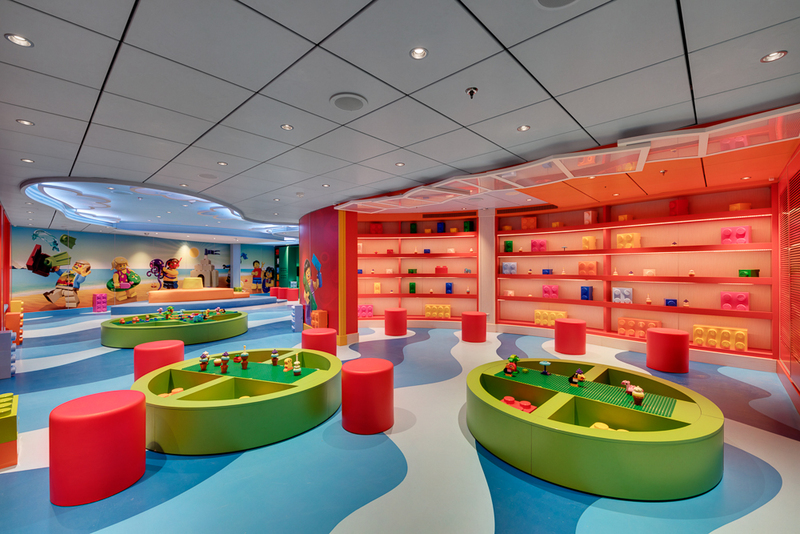 The Doremi Family lounge and program is where families can play together during their vacation. 7. The Luxury Ship within a Ship. The MSC Yacht Club is MSC's version of a 'ship within a ship' is where you can enjoy a private luxury yacht lifestyle within all the extensive choices of a 5000-passenger ship. We love this especially for extended families; those looking for a prestigious and pampered cruise with a private sun deck, lounge and restaurant, can also join other family members or take advantage of the dining, bars, views and activities in the main part of the ship when the mood strikes. 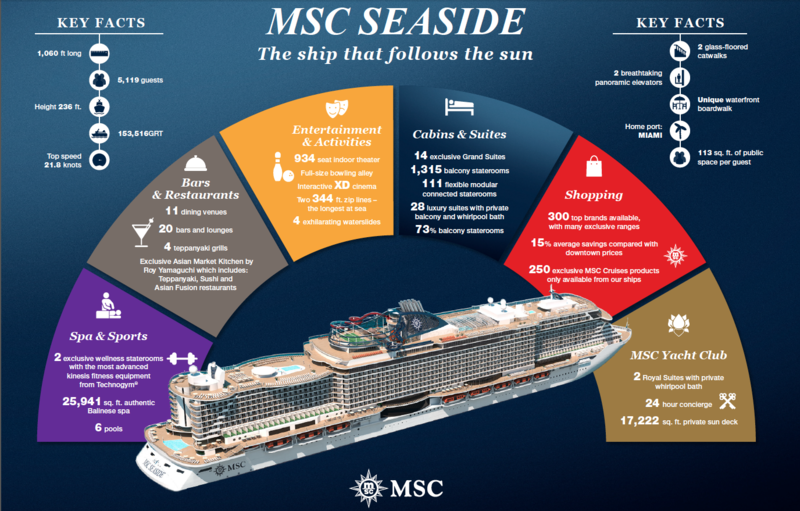 They call the MSC Seaside the 'ship that follows the sun'. We think this innovative new concept ship is going to gain a lot of followers itself. 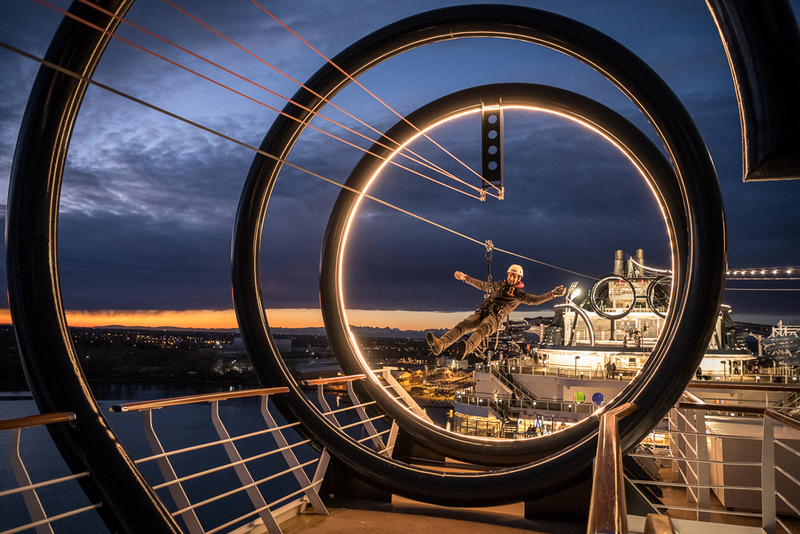 Check out even more wow facts and figures about the MSC Seaside. And check with us for MSC Seaside Caribbean sailings from Miami.